My first glimpse of the magic that is “The Kingdom of the Shades” came when I was sixteen, via the opening sequences of the film The Turning Point. The music, the image of twenty-four women attired in white, descending a tiered ramp through silvery lighting, striking arabesques in perfect synchronicity, haunted me. Particularly once I got some backstory on La Bayadère. In Act II, Solor, a warrior, is grieving the death of his beloved Nikiya, a temple dancer, and this scene, in the Kingdom of the Shades, is merely an opium-induced hallucinogenic dream of Solor’s. 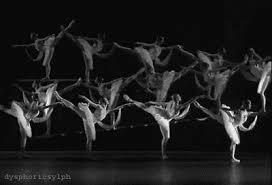 It is, I quickly learned, one of the crowning glories of the corps de ballet repertoire. Back to Saturday night’s performance at the War Memorial Opera House. The corps, descending the ramp to form six rows of four dancers, didn’t have quite the perfection of the Paris Opera Ballet dancers—arabesques weren’t at a uniform height 100 percent across the board, and a millisecond’s rush on coming out of the arabesques for some—but few companies in the world can outperform the Paris Opera Ballet here. And once San Francisco Ballet’s twenty-four Shades were in place, dancing with their slow, sustained développés and arabesques in unison, they shone. An unforgettable image, that mass of dancers in white tutus, moving as one. Soul-stirring. One regret is that the SFB chose to open the evening’s program with “Kingdom of the Shades” and not Ghosts. Commencing with the latter would have allowed audience members to appreciate the opener while savoring the anticipation of something more delicious to come. This way felt like eating dessert first, and made Ghosts seem a little like the vegetables. Ghosts is choreographed by Christopher Wheeldon, music by C.F. Kip Winger (who, interestingly, was a bassist for Alice Cooper in the 1980’s). Wheeldon is world-famous and much in demand, known for putting a contemporary twist on classical ballet steps, and vice-versa. In Ghosts, as principal Damian Smith phrased it in the program notes, there’s “an intertwined, off balance partnership that never seems to unwind, a kind of thread that’s constantly knotted.” Great costumes, silvery, translucent and diaphanous like something out of a dream, by Mark Zappone. A Great Scary Thing abstract sculpture dangles high above downstage right. When it descends further, with a mechanical groan, the dozen(ish) dancers assembled glance up and over their right shoulders in unison, frozen in this tableau state for several seconds. I found the dancing that followed to be beautiful, but curiously… un-engaging. There was nothing amiss, but nothing grabbed me by the heart and rocked my world. Not after Shades. I’d also been looking forward to seeing Damian Smith partnering Yuan Yuan Tan but, alas, those annoying eleventh-hour cast changes. I think this, too, tainted my appreciation. Lorena Feijoo seemed more power-house than nuanced, in an otherwise solid partnership with Gaetano Amico and Rubén Martin Cíntas. Yuan Yuan Tan was a standout with partner Vitor Luiz (although the fact that he wasn’t Damian Smith, who premiered this role with Tan in 2008, gave him an unmerited ding). Ensemble work was all solid and worthy—nods here to Dores André, Nicole Ciapponi and Shannon Rugani. Like I said, no complaints. But a plea to artistic direction: in the future, please don’t give us dessert first. In the way I’d hoped to fall in love with Ghosts, but didn’t, I hadn’t planned to fall in love with Firebird, but did. With music by Stravinsky, choreography by Yuri Possokhov, it was definitely not vegetables. Nor was it main course. More like an eclectic side dish you’d never tried before and found you liked. The first Firebird premiered in 1910, choreographed by Michel Fokine for the Ballets Russes, and this is one of many renditions that followed. It reminds me in some ways of the famous Rite of Spring which just celebrated its centennial last year. And perhaps that’s no surprise: same composer here, Stravinsky, and same choreographer, Yuri Possokhov (for the SFB’s version). And watching Firebird in its opening scene where Kaschei, the evil despot, and his creepy looking reptilian henchmen whirl about, Kaschei (played wonderfully by Pascal Molat) clutching a giant egg, the prize of all prizes, I felt the same gleeful energy that I observed in last year’s Rite of Spring premiere. Drawn from Slavic folklore, the Firebird is a mythical creature that can bring good fortune, or bad, to those who capture it. In this ballet, the prince catches, and releases the Firebird, who aids him later in freeing the princess imprisoned by the evil Kaschei. Tiit Helimets as the prince was charming and likeable – I’ve considered him a rather aloof dancer in the past, albeit a highly competent one, as befits a longtime principal. Sasha de Sola was a delight as the princess, alternately sassy and girlish. Molat’s Kaschei managed to be both comical and menacing, and the prized giant egg, itself, almost seemed to be a character, one tossed back and forth between villain and hero. In one scene, the prince has the egg and is running, with Kaschei and his crew in furious pursuit. Of course they can’t run far; they are onstage. Possokhov cleverly inserts a slow-motion action that’s hilariously effective and makes you feel the speed and intensity of a chase scene. Great, memorable stuff. Shades, Ghosts and Birds. You have until Sunday March 2nd to see the San Francisco Ballet’s Program 3 in action. Whatever order they put it in, the trio of tastings make for a satisfying, memorable night. Share the post "Shades, Ghosts and Birds: San Francisco Ballet’s Program 3"
This entry was posted in Ballet and tagged C.F. Kip Winger, Christopher Wheeldon, Damian Smith, Denis Matvienko, Dores Andre, Firebird, Frances Chung, Gaetano Amico, Ghosts, Kingdom of the Shades, La Bayadere, Lorena Feijoo, Maria Kochetkova, Mark Zappone, Mathilde Froustey, Nicole Ciapponi, Nikiya, Pascal Molat, review of San Francisco Ballet Program 3, Ruben Martin Cintas, San Francisco Ballet, Sandra Woodall, Sasha de Sola, Shannon Rugani, Simone Messmer, Solor, Stravinsky, Tiit Helimets, Vitor Luiz, Yuan Yuan Tan, Yuri Possokhov on February 26, 2014 by admin.